Sony KD-55XD9305 review | What Hi-Fi? 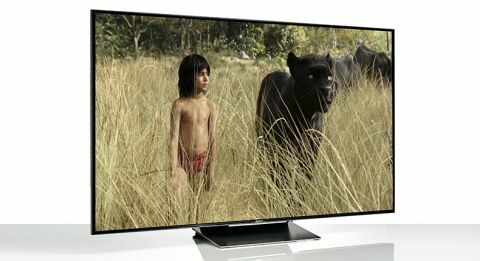 There are plenty of things thicker than this 55in Sony KD-55XD9305 TV, the first Sony 2016 TV to reach our test rooms, so we’ll list some of them here. There’s War and Peace, a chocolate orange, a toilet roll... you get the point: it’s dead thin. That isn’t why you should buy one, of course – though it does mean you can hang your telly on the wall like a picture frame. No, those five stars are more about the fact you’re getting a lot of TV for your money here, qualitatively if not physically. The main thing you ought to know about the XD93 is that, equipped with Sony’s 4K Processor X1 chip, this set is both Ultra HD and HDR compatible. There are a couple of extra technologies too, X-tended Dynamic Range PRO and the company’s unique TRILUMINOUS display, which are basically geared to delivering that HDR content as more than just a box-ticking exercise. What’s more, all four of the set’s HDMI inputs are waiting open-armed for that 4K content with HDCP compatibility, and three further USB ports effectively gives you an option for each day of the week. Unless you’ve already shelled out on a 4K Blu-ray player, you’ll probably be streaming most of your Ultra HD content, so will be pleased to find the customary Ethernet port present for most stable internet connection. Without dwelling on the XD93’s spec sheet too much, we make use of that port straight away, also plugging in a Panasonic DMP-UB900 4K Blu-ray player and TV cable, and whizz through to the homepage. Now, we ought make the point that this remote, though finely constructed, is more sensitive than the kid who gets picked last on sports day. Finding its sweet spot in order to change channel can be akin to performing a lumber puncture on a Borrower. It shouldn’t be a deal breaker, but if your aim is a little off, you might want to download the remote app instead. We’ve sometimes been less than complimentary about Android TV as well, but this appears to be its least convoluted, most intuitive form. Your homepage is neatly set out into sections for recommended content, featured apps, inputs, your remaining apps, games and settings, with each category significantly malleable. Don’t want to see that input you hardly ever use? Just hide it. Want another to be more easily accessible? Then move them around. Of course, that’s the ultimate benefit of Android as a concept, as is the building of your personalised collection of apps. Major streaming apps such as Netflix and Google Play, each of which have dedicated shortcuts on the provided remote, Amazon Prime and MUBI are included, as are the main TV catch-up services. We needn’t list the full portfolio of other apps here, but gamers may be particularly interested in PlayStation Now, which, once you’ve paired a DUALSHOCK4 controller with your TV, allows you to play selected PS3 games, such as The Last Of Us and Batman: Arkham City, directly through your TV or Blu-ray player with no console required. Besides the built-in Freeview HD tuner, there is also the benefit of YouView, which Sony first introduced to select models late last year. Its use is not compulsory, but it does bring a number of catch-up services all under one roof and allows you to scroll back through the EPG to find and stream some shows you might have missed. Though we’ve seen enough Android tellies to know our way around, we can’t imagine many people getting lost en route to tuning the thing in. We can imagine even fewer having any qualms about the XD93’s aptitude for 4K upscaling. We flick to find Channel 4’s coverage of the Formula One Bahrain Grand Prix practice in standard definition. Yes, you read that correctly, we watched live sport on a 4K TV without our thumbs itching to change at least to the high-definition broadcast. Most significantly, we’re testing with all Sony’s picture aids, those supposedly helping contrast, motion and whatnot, set to off. Of course the image seems softer when you switch between SD and HD, but it’s still an impressively detailed and cohesive picture with a composed natural colour pallette. F1 is ideal for showcasing this Sony’s remarkable control over motion; even with a picture so radically upscaled, the XD93 manages to avoid dizzying sweeps and blurring. Much as you’d expect, a change to Channel 4’s high-definition equivalent sharpens the picture considerably. Sharpness has not been a recent concern of Sony’s, nor is it with the XD93, but most impressive is how each faculty is elevated by the switch to HD; those sharp edges are unconcerned by cars zipping around the circuit, and the drivers look like humans in the post-race interviews. Rather basic criteria, you may think, but we’ve seen some sets where they’d more closely resemble the colours of a character from the Simpsons. We also get a better idea of how those LED strips are working at each side; previously we’ve criticised Sony for uneven, blotchy pictures where light is not spread evenly across the screen, but there’s no sense of that here. The 75in equivalent of this set will be fully and evenly backlit, but it’s a pleasure now to find we needn’t move house to accommodate a Sony TV with an even spread of light. What we’re really waiting for, though, is to test the XD93’s HDR capabilities, so we head eagerly for our 4K Blu-ray of The Amazing Spider-Man 2. Here it’s important that you reconfigure your HDMI port to set it to HDMI 2.0; it’s easily done, but crucial if you want anything greater than 1080i output. Sony explains that some older DVD players in particular find difficulty communicating with HDMI 2.0 – think your Gran attempting to master Snapchat. This way, though, all four HDMI ports can be compatible with 4K content without encountering those communication problems. It takes a system restart once you’ve changed the setting, but we’re of the opinion this flexibility is a good thing. Now for starters, the 4K picture is more crisp than Gary Lineker’s pay packet; we really begin now to appreciate Sony’s handling of motion as well, which helps us circumvent feathering the outlines of silhouettes in order to avoid judder. Without wanting to repeat ourselves, it’s another step up in all regards. But it's HDR (High Dynamic Range) we’re most interested in. We’ve spoken previously about this technology’s capabilities, the most impressive of which is the brightness and darkness of those extreme colours. That isn’t necessarily what we get from Sony’s XD93. By switching HDR on we are extending that dynamic range somewhat, but it isn’t the kind of difference that would strike a newcomer within 30 seconds of entering a TV showroom. No, what impresses us about Sony’s interpretation of HDR is what we believe is most important: a broadened colour palette in terms of gradation that panders to the subtler hues, making skin tones appear more natural and even bolder colours more nuanced. When you hear the phrase ‘higher dynamic range’, you may be most likely to associate that with a broader scale of contrast, but Sony here proves it’s what’s in between that counts. No one this side of reality could believe two grand is throwaway money – it’d be many an unwanted sober weekend before most of us could afford a set such as this. So when we say you’re getting a lot of telly for your money, it ought to read as quite a statement. We have seen other HDR sets that render the immediate, show-off contrast better, but that won’t last unless you’ve got what Sony has here. This is not a set simply keeping up with technological advances, but one proving why HDR can be an advance in absolute terms. There may be a better television than the XD93 out there, but you’ll be searching a while before you see one that will reduce your enjoyment of Sony’s latest 55in offering. Simply, there’s little of any matter that could keep us from imploring you to buy this. Good? Then that just about leaves us enough space for another go at the introduction: what about blackbird, microphone and a… goat?